I have been reliably informed that there is a fine distinction between kuchen and torte in German. The former translates as ‘cake’, the latter as ‘fancy cake’. 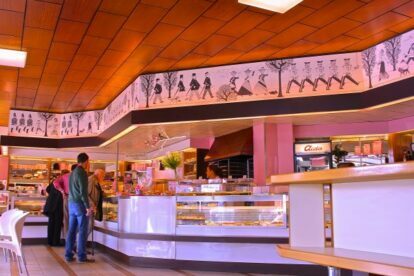 Aïda specialises in the manufacture of fancy cakes which ensures that this chain is synonymous with any image of Vienna you’d care to conjure. If you could say one thing about this franchise it would be that it is ubiquitous. There aren’t many corners you can turn in Vienna without spying their famous pink sign. This is problematic when pinning down a location, as technically you could go anywhere and expect to find one. My personal favourite franchise, however, is on the Wollzeile, the new-ish side of the first district, close to Prückel and Stubentor. It was there I first forged abiding feelings of warmth for Aïda, indulging shamelessly in the layered Esterházytorte and a cup of the frankly unbeatable Aïda hot chocolate. The waitresses (and they are almost exclusively female) are immaculately turned out in pink and the décor is fabulously retro. The menu is very clearly explained with colour pictures of all the treats. Okay, it may be true that the average age of the customers goes up by a decade or so as soon as you walk in – the chain is beloved by the silver-haired – but I love it. If you live for good cake, so will you.